On Finao Sportfishing our Cobia fishing charters are one of the most popular trips we offer in the Summer. 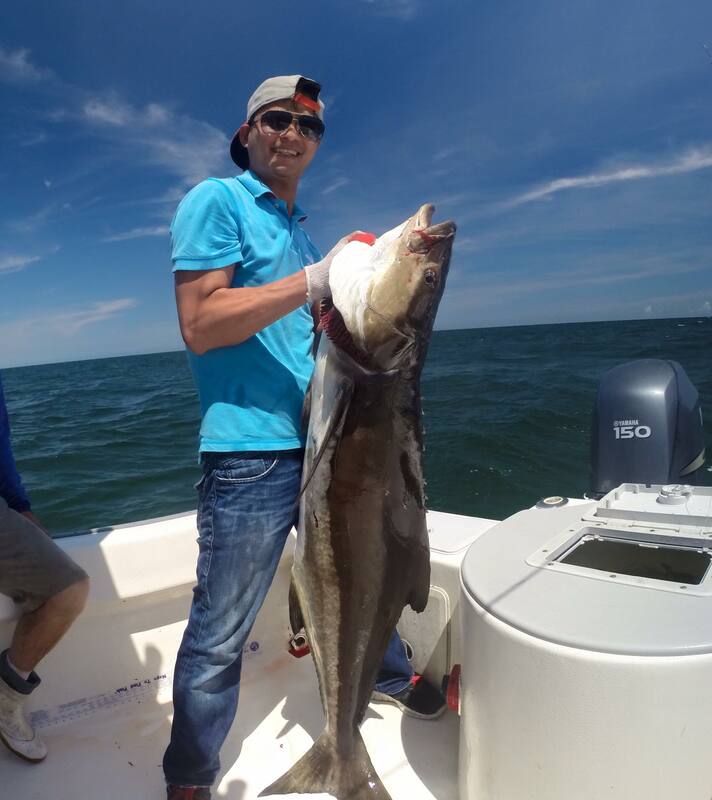 Cobia come into Virginia in late May and stay through September. Our Marina is located at 8166 Shore Drive Norfolk, Virginia. It is on the shore of the Chesapeake Bay making it short run to the best Cobia fishing grounds. 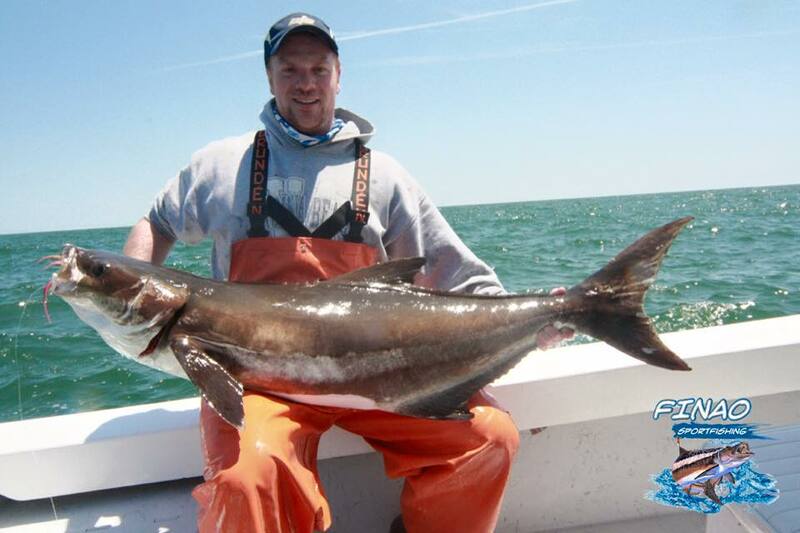 Virginia is known for being one of the best states to Cobia fish in. People from all around the World travel to Virginia to target Cobia. Booking a Cobia fishing charter with Finao Sportfishing allow you a great chance at catching a Cobia of a lifetime! 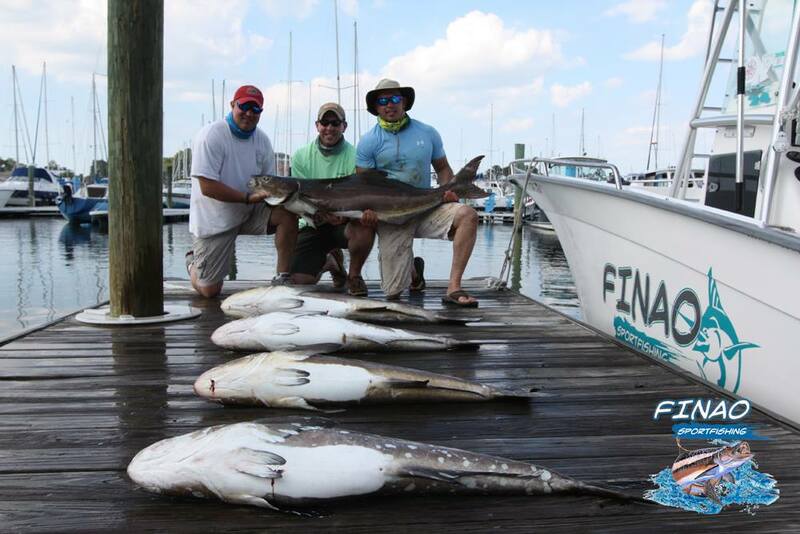 In the Summer of 2014 the TV Show “Fin Chasers” filmed a episode on Cobia fishing with Finao Sportfishing. The episode was a great success catching countless Cobia and aired on two TV Channels multiple times. These TV channels were Destination America and The Pursuit. 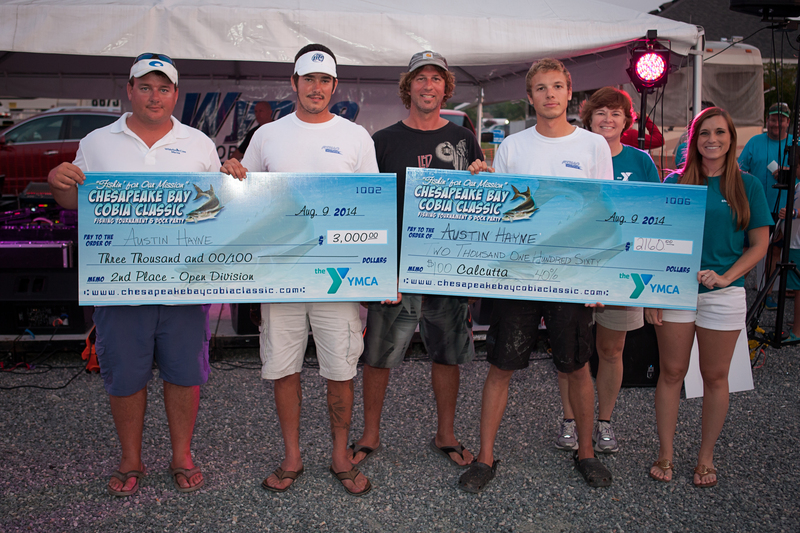 Finao Sportfishing has also won and placed in many large Fishing Tournaments on the East Coast for Cobia. Cobia vary in sizes from 10 pounds to over 100 pounds. The world record Cobia ever caught was 141 pounds. The average size of the Cobia we catch on Finao Sportfishing is about 30-50 pounds. It is not uncommon that we catch them over 70 pounds! Cobia migrate up and down the East Coast annually. In the colder months of the year they stay in the southern states where the water is warm. When the water temperature rises into the upper 60s it is warm enough for Cobia to move into Virginia waters. The Chesapeake Bay is one of the greatest fisheries on the East Coast. 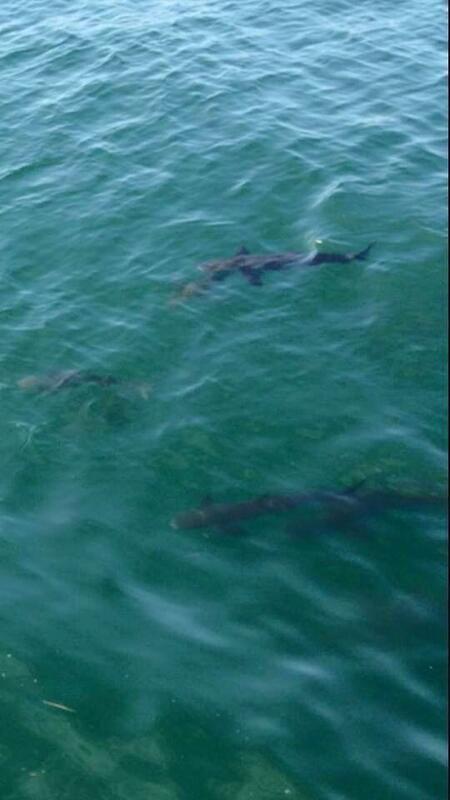 Cobia move into the Bay and spawn all Summer long. This allows us to catch some of the largest Cobia on the East Coast. Cobia regulations in Virginia allow us to keep 1 Cobia per person at a minimum size limit of 37 inches. Cobia are one of the greatest tasting fish in inshore waters. Often sold at fish markets and restaurants all over the United States. Cobia is a mild tasting and white flaky fish. Keeping Cobia allows our customers to go home with high quality fresh fish. When on Finao Sportfishing there are many different fishing techniques for Cobia that we use. Sight Fishing is one of the most exciting and productive ways we fish. Cobia swim on the surface of the water making this style of fishing one of the best ways to catch Cobia. Sight Fishing allows us to cover miles of water searching for Cobia instead of having to wait for them to come to us! When Sight fishing you often see many other species on the surface. Sharks, Rays, Turtles, Dolphins, Red Drum, and Menhaden also swim on the surface making Sight Fishing always exciting. Another good technique for Cobia that we use is Chumming. Chumming is an old school style of fishing. It is bottom fishing but with a little twist. Chumming is anchoring and putting cut fish in the water to get a scent trail to attract Cobia to the boat. Once the Cobia have found the scent trail they will stay behind your boat in search of where the scent is coming from looking for food. This technique is great in the morning and evenings. When Chumming for Cobia it is not uncommon to catch other fish species like Red Drum, Sharks, and Rays. Click Here to book your Fishing Charter with Finao Sportfishing! Click and View the video below to see what its like to Cobia fish on Finao Sportfishing.